The ETM DM are compressed air treatment modular units that can be connected to each other via MASTER/SLAVE logic. Each unit integrates a high-efficiency compact aluminium exchanger, a separation system and a condensate drain. In the MASTER configuration, the ETM DM modules include an electronic control unit that ensures correct operation. The upgrading of large systems for the production of compressed air is often problematic and very expensive due to the lack of available space in equipment rooms. ETM DM modules perfectly solve this problem because, thanks to their compact dimensions and the possibility of being connected to a chiller located outside of the compressor room, they can also be easily integrated within existing systems. Very often large systems are not designed according to redundancy criteria as the installation of multiple dryers in stand-by with the corresponding piping take up valuable space. During maintenance these systems must therefore be put offline causing costly system downtime. The modular approach of the ETM DM ensures intrinsic redundancy of the critical components and therefore enables the reduction of periods of system downtime. The load profiles of most of the manufacturing industries are highly variable. The flow rates of compressed air to be processed and the process temperatures fluctuate greatly during the day, forcing the dryers to operate at partial load for most of the time. 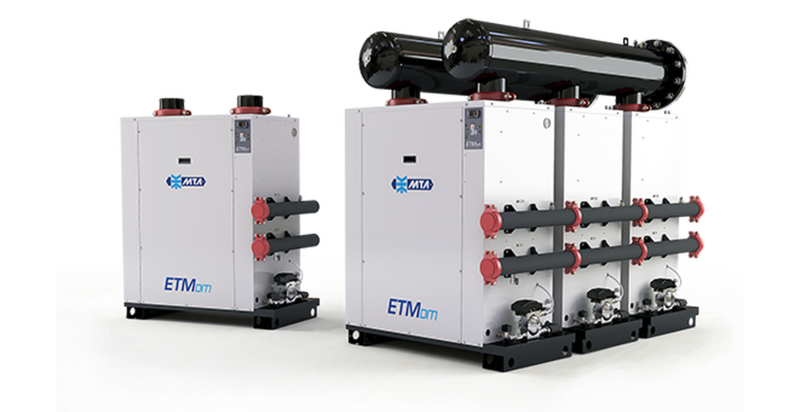 The system, consisting of one or several ETM DM modules connected to a TAEevo chiller thus equates to a thermal mass energy saving dryer as it is capable to adapt its energy consumption to the actual requirement for inlet compressed air, ensuring the highest level of energy saving. It is possible to choose between several chiller + drying modules combinations by sizing the system to ensure optimal pressure loss level without affecting the level of electrical power absorbed while increasing the level of redundancy and safety of the system.